Continuous 160A Current, Peak 1200A Current! 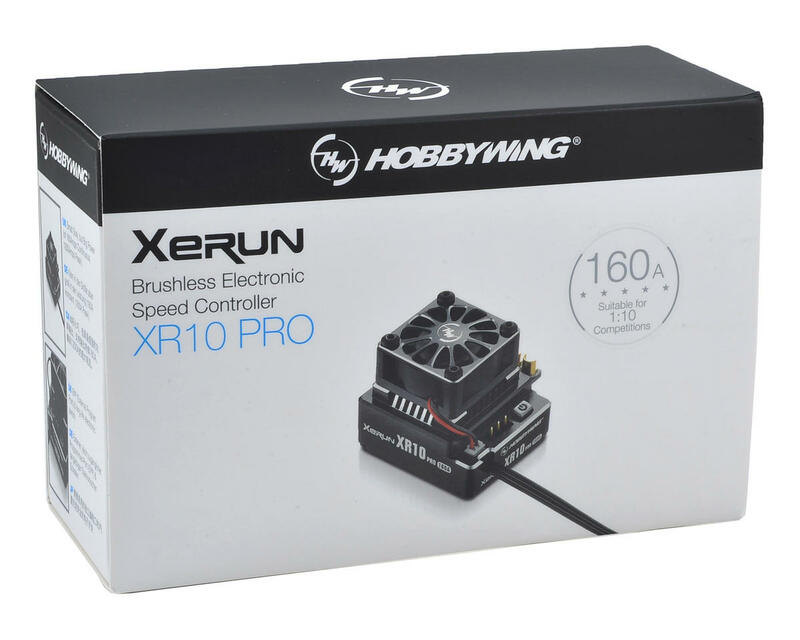 The Hobbywing Xerun XR10 Pro 160A Sensored Brushless ESC is specially designed for competitive racing at the highest level. 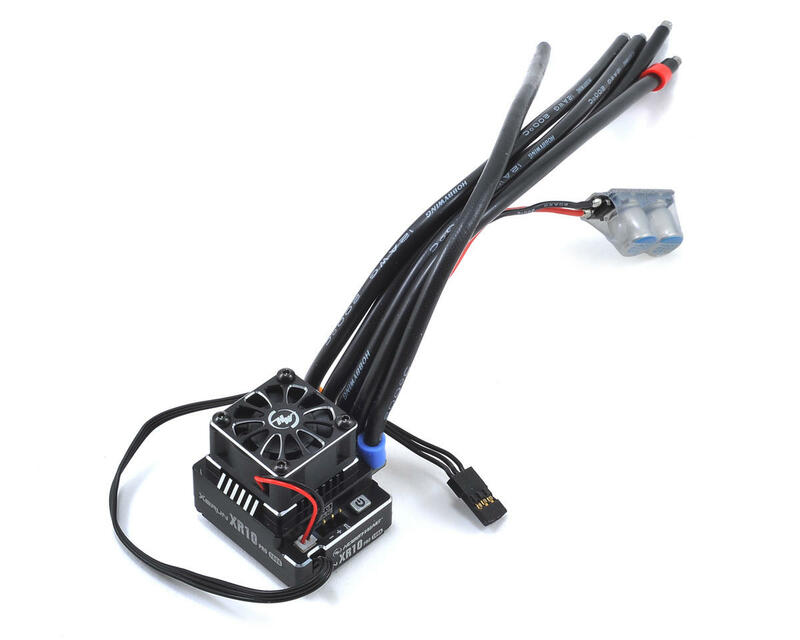 It's reliable hardware, combined with intelligent software (containing 10 common select-to-use profiles), creates an ideal power solution to 1/10th scale top touring car, pan car and buggy racing. Using the Hobbywing WiFi Express Smartphone Programmer Module*, your iPhone or Android device can be used to remotely program parameters, upgrade firmware and check relevant data of the ESC without leaving the control stand. Of course, the Hobbywing WiFi Link App must be installed on your device. 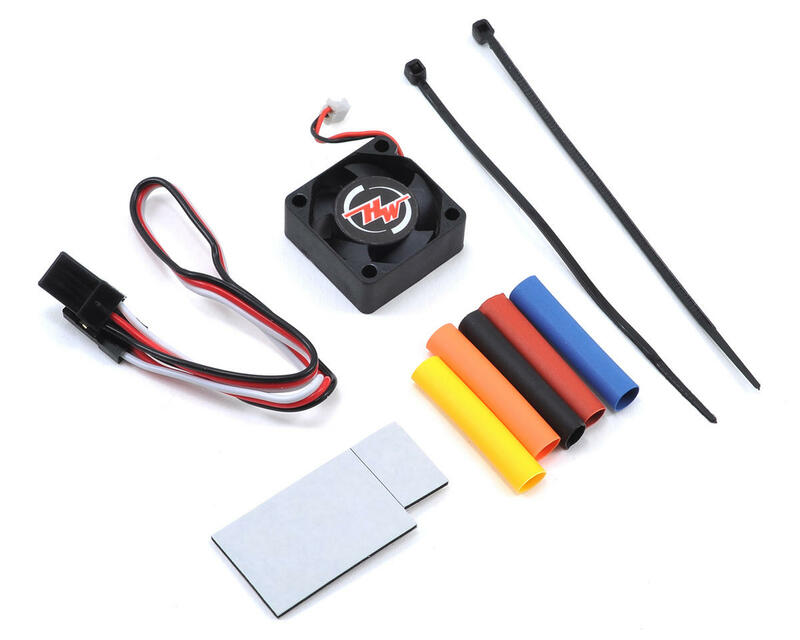 Independent and adjustable throttle & brake PWM frequencies guarantee precise and accurate throttle and brake control for all classes of competitions, especially the Stock class. Hands down the best ESC I have ever used. Combined with the LCD Programming box, setting up & adjusting this ESC is a breeze, and the sheer amount of adjustability it has is incredible (like 100 points of adjustment for drag brake). The ESC is very well built with a solid aluminum base, and comes with leads pre-soldered (all black) and ready to use. The detachable fan even comes pre-mounted, so you can go straight from the box to your chassis. Hobbywing is even nice enough to include a spare fan, should the need arise. One of the things I really like aside from the workings of the ESC, is that the power switch is part of the ESC itself, as opposed to a separate switch connected by a wire, and the ESC also has a dedicated port for plugging in the programming box, so you don't need to unplug your fan to do some tuning, which makes the whole process faster. Additionally, this ESC has a "smart off" feature which turns off the ESC if you hold the car at full brake for 8 seconds straight. While I didn't think this was a feature i'd ever use, its actually really handy after a run, as you don't have to reach under the car's body to hit a switch. If I had to list a complaint, it would be that the fan is always on, and cannot instead be set to engage at a certain temp. Not really a big deal, since for an ESC of this caliber, its mainly being used for high performance & competition, and thus would likely be set to always be on anyway, it just would have been nice to have the option. Regardless, its still an incredible ESC, and I have no doubt it will last for many seasons of racing. I love this ESC and am running it in a Tekno ET410 with a 10.5T motor. I have been running Tekin for years. Tekin makes great ESCs too but there's things I don't like about them like their power switches and especially their capacitors. The fan mounting on my RSX is ridiculous too. The Hobbywing takes care of all of that nonsense for you! I love that the ESC comes with wires already soldered on. Just cut them to length and solder them to your motor and battery connectors. Done! I also like that the capacitors are already soldered on with soft wires and a flat spot for mounting the capacitors anywhere with double sided tape! The power switch is great too. It's a backlit button. The Tekin is the same as power switches were 20 years ago. It's cheesy and has more wires to run. The HW power button is right on the ESC. I love that. I also like how smooth this thing is. I don't know how to describe it. There's a real nice difference though. Especially the brakes. I also like that I can hold the brake for seven or eight seconds after a race and everything powers off. Real nice. The fan comes mounted already and if you ever have to remove it, it's just four screws. No silly bushings and metal plates and silly nonsense the RSX has. I am sold on these and this will be my ESC of choice for anything 1/10 scale from here on out. If you have the budget,don't think twice. This esc is small in size but a beast in performance and what it can offer in terms of options and tunibility. I got one directly from hobbywingdirect. It out performs any other esc on the market, and in terms of options it even outperfoms other HW surface ESCs. i had this in my xb4 for a while and one day started to act up with random shutdowns, i contacted HW and we worked through all the troubleshooting issues, they had me send it in and reported back that the board had failed. even though it was out of warranty HW explained to me they could replace the esc and sent it out. well it was stolen from my mailbox and after i contacted HW explained the situation they told me they would send another replacement and only charge me shipping which was $7. so in the end they not only replaced the out of warranty esc at no cost to me but when it was stolen from my mailbox sent out another and only charged me shipping fees, GREAT CUSTOMER SERVICE!!! I have had several brand motors and ESCs. After the proven durability in my RTR I figured I would give the XR10 Pro a shot in my new carpet racer. Paired with the WiFi tuner it is light years ahead of anything out there. I love it!!!! I have had my XR10 for a few weeks not. I ran it for the first time at a race last weekend and it held up just great. No issues at all. I have been able to program it using both the programmer itself and using the computer software. setting save just fine and it runs great. Im already looking to get another one. Good size, easy to program, pre-soldered wires from factory (always a bonus). Great brakes! I bought a few of these. Haven't had any issues with one, but the other, it froze the 2nd time out. Had it repaired on the advice of hw and it came back with a few scratches and a stripped screw. Now the one problem unit, it won't hold it's program. Great. The real kicker here was that hw wanted to charge me to get me the stripped screws after I just spent over $400 On their product. I bought a new item, I shouldn't have to be dealing with stripped screws or scratches. No more hw stuff. They just lost several hundred bucks in future esc purchases, not to mention sharing this story and from others I've seen on the web..others will likely consider another brand. 2 of 12 customers found this review helpful.